Finally we could break away from the computer and spend a day exploring this beautiful part of the world. Where to today? 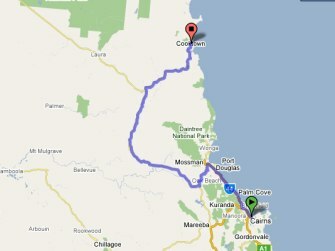 Well, we went up to COOKTOWN, the city where Captain Cook’s ship, the Endeavour, came to shore in 1770. 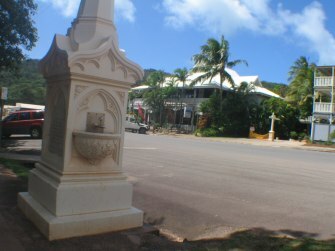 It is located around five hours away from Cairns, so we decided to have an early start and enjoy our day in this historical town. Our first stop of the day was this absolutely gorgeous beach along the way. 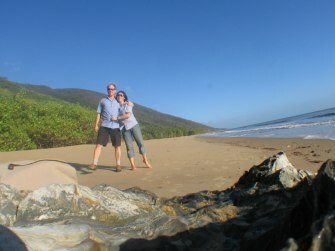 We don’t know the name of the beach, but it didn’t stop us from leaving the car and taking some photos, so we could share with you the beauty of the beaches of Tropical North Queensland. If you don’t believe me, you only have to have a look at the photos and decide for yourself. 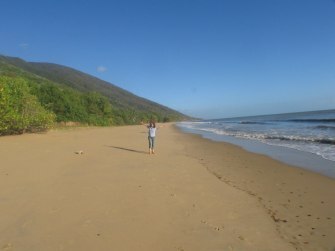 From this beach located north of Cairns, between Cairns and PORT DOUGLAS, we drove all the way to Cooktown, only stopping to take photos in a couple of places we found interesting. 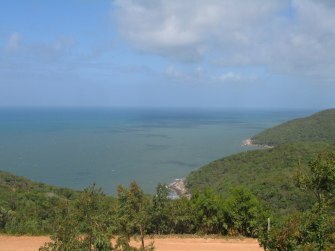 One of the them is the BLACK MOUNTAIN NATIONAL PARK. 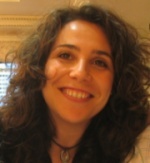 You can read all the information in the link provided, but here you have a couple of interesting facts. 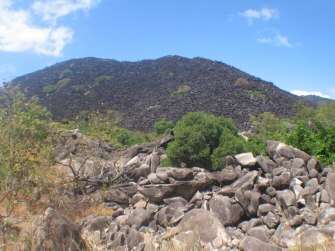 As you can see in the photo, Black Mountain National Park contains an imposing mountain range of massive granite boulders. These formidable boulders, some the size of houses, stack precariously on one another — appearing to defy both gravity and logic. There are many legends about this National Park. Many local stories (but few local records) tell of people, as well as horses and whole mobs of cattle disappearing in the labyrinth of rocks, never to be seen again. Beneath the outer boulders lies a maze of passages and chambers - very appealing to explorers of unusual places and those wishing to hide away from pursuers. In the inky dark interior, sheer drops, pockets of bad air or unexpected encounters with snakes or bats could easily cause disorientation, panic or injury to intruders entering that eerie underworld. Adding to its mystique, pilots report aircraft turbulence (thermal current) over Black Mountain and, observers record loud bangs (cracking rocks) and mournful cries (wind and water moving deep inside). Even though there’s always a good scientific explanation for these things, I prefer to believe the legend, I find it much more interesting. 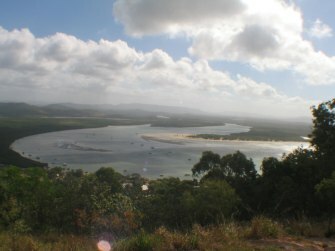 Cooktown has many different sites, all of which take you back 200 years, when Europeans first came to Australia. 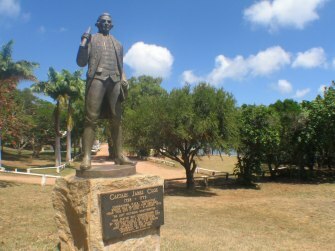 Being Cooktown named after Captain Cook, it’s only logical that there are some monuments dedicated to him, up to six. 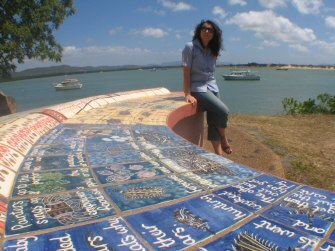 Also visitors can see the MILBI WALL, which is an impressive collage that the Aboriginal people of Cooktown created to express the significance that the first encounter with Europeans had for them. The wall includes stories from the Dreamtime up to present time, mentioning how a few Aborigines had excelled at sports internationally. The most interesting story for me was that of the Normanby Woman, a white woman who lived with an Aboriginal tribe. When the authorities realised, they captured her to bring her back to the white society, but she died soon afterwards, never returning with the Aboriginal people. But I had to choose which site impressed me the most, it would definetely be Grassy Hill, where the lighthouse is located. 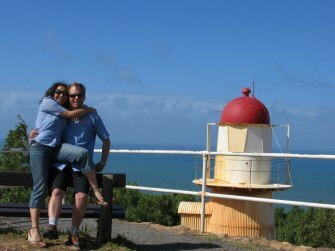 The lighthouse itself is pretty small, but the views of the area from the top of the hill are absolutely sensational. One of the photos is taking pointing to the north and the other pointing to the south, but the spot where we took them from is the same. Amazing, isn’t it? The cemetery is also worth visiting, so much history. The Normanby Woman is buried there, but also there are some Jewish tombs as well as Chinese. 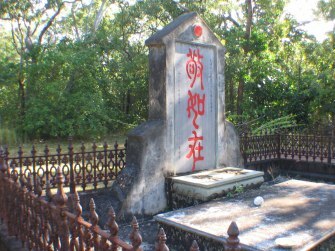 Over 300 Chinese were buried in this area between 1873 and 1920. Chinese emigrants fear they might day, never to return to the land of their ancestors. Most of those initially buried here were later exhumed and returned to China. The three characters on the shrien, written in ancient script, read Tjin Ju Tsai - Respect the dead as if they are present. And the monument next to the Chinese shrine is dedicated to Mary Watson, who died of thirst. In case you cannot see it clearly, it is a fountain. The story of Mary Watson is very sad. While her husband was away “on a business trip”, he was a fisherman, Aborigines from the mainland attacked her house in LIZARD ISLAND. Some of the Chinese servants were killed, but she managed to escape with one of the servants and her little kid. They survived for a while on a boiling tank, but finally they all perised due to the lack of fresh water. And this is the reason why a fountain was erected to commemorate her name. And after spending the whole day in Cooktown visiting all these different sites and monuments, we thought it was about time to head back to Cairns. 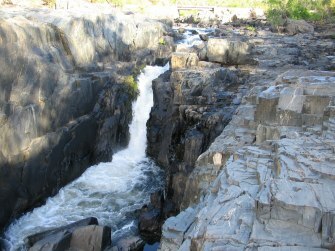 But on the way, we still had time to take a photo of this impressive “river of rocks”, as I see it. And the photo next to it is just a nice photo of both of us, from the Grassy Hill.